WELCOME TO MY MONEY MISSION ONLINE: ANNIVERSARY AND MOM MINUTES! WHAT A COMBO! ANNIVERSARY AND MOM MINUTES! WHAT A COMBO! It is now official; I have been married 18 years now! Today is hubs and my anniversary, and, in the words of Karen Carpenter, "We've only just begun..." :) Time sure flies when you are having fun!! I wish I had some before pictures, but when we got married, we only had a 35mm camera and not the fancy-schmansy digital one that we have today. I can tell you that we had a Wednesday evening church wedding at our church in the small town next to our small town. It was lovely, I wore a Hunter Green jacket/suit combo with gorgeous satin-y pumps to match, (brides in our church rarely wear white), my groom looked very handsome in his new suit, we had a wonderful reception in the same building where my Mom and Dad had their reception almost 30 years beforehand, and then we were off on our honeymoon. We went to Galena for a few days, then hubs went to work for a few days, then we had Thanksgiving with family and then it was off to Chicago for another few days. It was definitely memorable!!! Like I said in yesterday's post, I was going to post some Mom Minutes Thanksgiving Tips. These are very easy to follow and I think you'll like them. 1. Don't Stress. If the Turkey doesn't turn out perfectly, who cares? As long as it is cooked thoroughly and carved into slices, no one will notice. If you want, pour a little gravy over the slices and that will make it look "restaurant perfect!" 2. Speaking of gravy, no one has to know that it isn't homemade. Buy a can/jar of it at the store. Heat it up, pour it into your favorite serving container and no one will be the wiser! 3. Stuffing doesn't have to be labor-intensive. Everyone works nowadays, and there is just too much work in making homemade stuffing like my mother used to do (back when I was a girl growing up in the 40s and 50s). That is why Stove Top was invented!! 5. The table does NOT have to look "Martha Stewart." You do NOT have to hunt through the woods for twigs and berries. You do NOT have to arrange everything picture perfect. Set a candle on the table or counter top. Arrange some favorite Thanksgiving knick-knacks around the candle. Voilà! Instant decorating! Remember that Thanksgiving is a time to be with family and friends and to enjoy yourself. Don't be a slave to the kitchen! Happy Anniversary to both of you A.Marie, may God bless you more with happiness and blessings! Stuffing is easy-get a bag of Pepperedge Farm dry stuffing mix. Makes as per bag. Stuff turkey. Pop in oven and later you've got great tasting stuffing. Off to docs this afternoon for me and Alex. Boss isn't thrilled as hubby yet again is off for the weekend and she is at an all day seminar but grandma will just have to come care for grandpa. She didnt even say anything other than make sure grandpa is taken care of. HAPPY ANNIVERSARY!!! 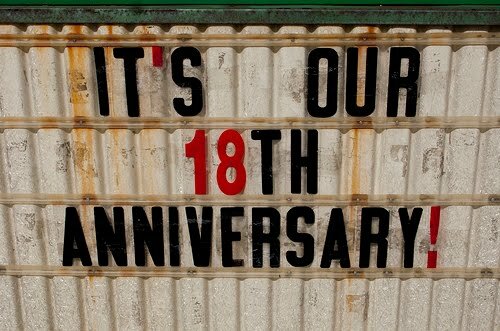 We celebrated 18 years this year too and you're right: It's only just begun! Annie Jones, My Mom is awesome! It is so funny how everyone raves about her "homemade" stuffing, how good it is, so on and so on, and it is just Stove Top! She thinks it is so funny! Helene, You and Alex are more than welcome to come for Thanksgiving! You could bring the stuffing! I don't think Mom has ever tried making it your way. BTW: Your boss would drive me nuts...absolutely NUTS! Hi Lola! I really haven't been ignoring your blog; I've been so busy that I have been ignoring everyone's blogs! I'll make up for it this weekend! Hub's new dog woke me up at 4:30 a.m. this morning (UGH!) so I am sitting at the computer "catching up!" Congrats on 18 years! WOW. Den and I just had our 15th and I told him that if I had shot him I would have served less time. Maybe I shouldn't have said that. He laughed. After this long, he is used to my mouth.